Eye Makeup Remover is produced by the Ukrainian beauty brand Dr. Sante for its Camomile Allergy STOP series. This is a gentle hypoallergenic product which is specifically designed for sensitive and delicate skin around the eyes. It effectively removes makeup without causing irritation. Enriched with bisabolol and white cotton extract. Skin around the eyes requires careful care because it is very easily damaged. Regular use of Dr. Sante Camomile makeup remover helps to minimize the risk of skin damage in this sensitive area and prevents dryness, irritation and premature wrinkles. The product is formulated with bisabolol. This ingredient is derived from chamomile essential oil. It has soothing, regenerating and protective properties. Bisabolol also helps to eliminate the visible signs of stress and fatigue. Cotton extract is the second key ingredient of the makeup remover. It helps to protect the skin from harmful environmental factors, makes it softer and has a refreshing effect. Directions. Apply onto a sponge or cotton pad and remove makeup with light motions. Ingredients. Aqua, Poloxamer 184, PEG-40 Hydrogenated Castor Oil, Sodium Chloride, Dipotassium Phosphate, Disodium EDTA, Butylene Glycol, Gossypium Herbaceum (Cotton) Extract, Bisabolol, Polyaminopropyl Biguanid. Want to buy Eye Makeup Remover? Call us or submit your order via our web site! Camomile Allergy STOP! 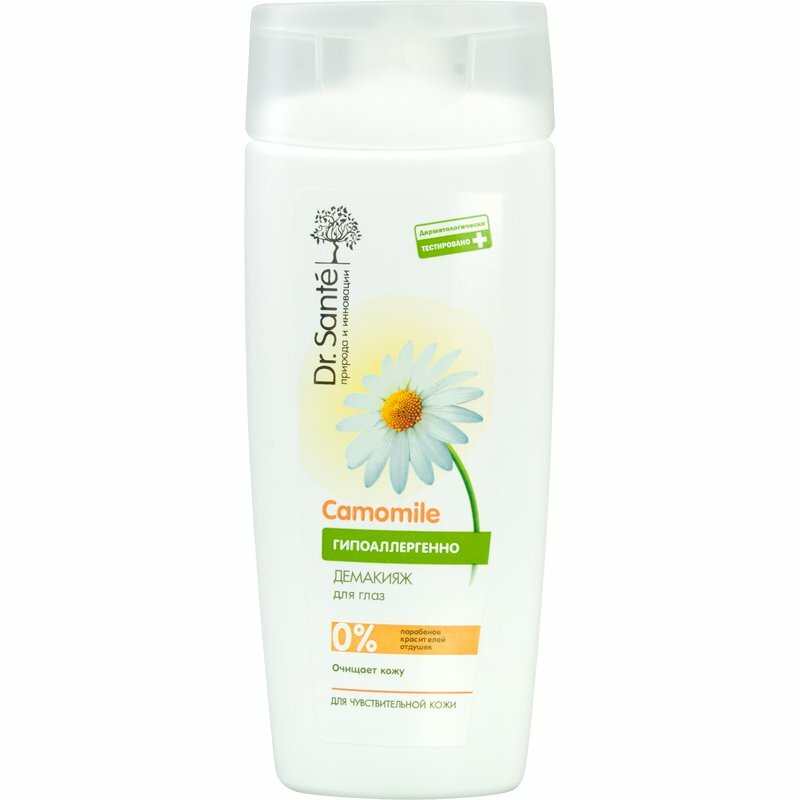 (Dr. Sante Camomile) is a cosmetic series specifically designed for sensitive and allergy-prone skin. It is produced by the brand Dr. Sante owned by the Ukrainian group of companies Elfa. The series is comprised of hypoallergenic face care products that have been dermatologically tested in Poland. The key features of the products branded as Dr. Sante Camomile are gentle care for the beauty and health of the skin which has low tolerance to external irritants as well as improving the skin’s protective properties in order to reduce its sensitivity. All products in the series are formulated with safe natural ingredients that do not cause skin dryness, redness, flaking, itchiness, irritation, etc. Dr. Sante Camomile formulae are based on bisabolol and white cotton extract. These two ingredients have a pronounced positive effect on the skin. They prevent inflammation and irritation, sooth and protect the skin, stimulate its own protective mechanisms. Dr. Sante Camomile beauty products do not contain potentially harmful and unsafe ingredients such as SLS, SLES, parabens, synthetic colourants and fragrances, mineral oils. That is why they provide really effective and safe care for sensitive and allergy-prone skin. Try them out and see for yourself!